Sky Brown has had some Internet fame for a few years now, despite the fact that she’s only 8 years old. 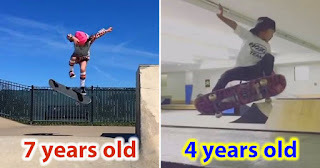 The girl from Miyazaki City, Japan is regularly featured in YouTube videos and clips on Instagram of her skateboarding better than most grown men. She’s what you could certainly call a prodigy. Brown also has a 4-year-old brother Ocean who is hot on her heels in both skating and surfing. Together, they very well might be one day be the best sister/brother skating/surfing combo. Interestingly, Sky is also a surfer and loves going with friends. “When I was little I used to hassle my dad to go with him for the morning surfs so I could play on the beach, I would even get into the car and refuse to leave. Then one day my dad got me a soft board and pushed me into some small waves, and that was that. I was hooked pretty fast hahaha. Now I get up super early every morning and jump on my dad until he wakes up and takes me surfing.” she said.